The American Buffalo coin is a 24-carat bullion coin first offered for sale by the United States Mint on June 22, 2006. For the first time in its history, the US Mint was commissioned to offer investors around the world the opportunity to purchase a 999.9 gold bullion coin. The coin, also known as a gold buffalo, was authorized by Congress in 2005 with the Presidential $1 Coin Act which delegated the production of a one-ounce 24-carat gold bullion coin with a face value of $50 and a mintage limit of up to 300,000 coins. Gold Buffaloes are among the world's purest gold coins guaranteed by the US government to contain the full weight of the precious metal. The American Buffalo is the only gold coin produced by the US Mint to contain a 99.99% purity. As such, the Gold Buffalo coin can compete with other leading bullion manufacturers around the world for gold content, design and security. Backed by the United States Government, the American Buffalo is an excellent investment choice and promises an excellent return of profit. By law, the gold for United States Mint American Buffalo gold bullion coins must be taken from newly mined sources in America. Although the American Eagle was always a top-selling coin, there was an increasing demand from investors in the US and around the world for four-digit purity gold bullion coins to match popular coins such as the Canadian Maple Leaves. The American Gold Buffalo was introduced to fill that gap. The American Gold Buffalo coin is designed after the famous 1913 Type 1 Buffalo Nickel created by James Earle Fraser, one of the most prominent American sculptors of the first half of the 20th century who served as an assistant to Augustus Saint-Gaudens. As a child, James Fraser was exposed to frontier life and the experience of meeting Native Americans. The coin features the familiar Indian Head together with a Buffalo to pay tribute to the indigenous natives. The American Buffalo Gold Bullion Coin represents the convergence of timeless elegance in numismatic design and uncompromising quality in coinage production, the result of which is this one ounce gold bullion coin so much welcome in major investment markets worldwide. Liquidity is a very important element for an investment, and that’s actually the American Buffalo Gold Bullion Coin’s strongest point: with its unique backing by the United States Government, it can easily be sold for cash at most coin and precious metals dealers worldwide. 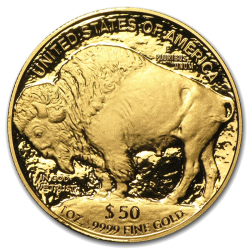 The 1 oz gold American Buffalo is 32.7 mm in diameter, 2.95 mm thick, it has a reeded edge, and a legal tender value of US$ 50, although its face value is clearly symbolic since the value of the gold it contains has historically been far greater. The obverse side of the coin depicts a Native American, whom Fraser said he created as a mixture of the features of three chiefs from the Sioux, the Kiowa and Cheyenne American native tribes who posed as models for him to sketch. The obverse also bears inscriptions of the motto "LIBERTY" on the top right, the year of mintage on the bottom left, and below the letter F for Fraser. On the reverse of the coin stands an American Bison, commonly referred to as buffalo, atop a mound of dirt. The animal depicted on the reverse is believed to be the bison named Black Diamond, a buffalo who lived in the New York City Central Park Zoo during the early 1900’s. Here we find the inscriptions "E PLURIBUS UNUM" above the buffalo's lower back, the phrase "IN GOD WE TRUST" the motto that has appeared on all US gold coins since 1908. The country of origin is engraved along the top. Also displayed are the face value, weight and purity of gold content. Both depictions have a rural, living-in-the-country style, against a rough background, a highly unusual genre design for such high purity gold coins. Together with all US bullion coins, gold American Buffalos are struck at the United States Mint at West Point, New York although only the proof version carries a mint mark. The West Point branch is the newest US Mint facility, gaining official status as a branch mint in 1988. The United States Mint strives to produce coins of consistently high quality throughout the course of production. The mint’s strict quality controls assure that coins of this caliber are produced from each die set throughout its useful life. In West Point’s advanced technology manufacturing facilities a die set is used as long as the quality of resulting coins meets United States Mint standards, and then it is replaced, continually changing sets throughout the production process. After thorough inspection, the coins are neatly packaged and shipped, reaching their destination in perfect condition. Buying from a reputable dealer you can be 100% certain that you are getting what you paid for, even if the premium tends to be a little higher. The truth is that this coin (characterized as "a beauty" by numismatists and investors alike) is so famous and desirable that dozens of different brands advertise on TV and sell their gold plated duplicate products on line, often using misleading mottos. Indeed the Gold Buffalo seems to have been copied as much (if not more) as Krugerrands, Eagles and Sovereigns. However the copies are of very low quality and certainly do not meet the weight and dimension specifications - invariably sell for at least twice the price of any credible testing gauge for Gold Buffalos. As leading dealers in gold bullion CoinInvest is always interested in hearing from anybody who have precious metal coins for sale. If you have an American Buffalo coin for sale, do not hesitate to contact a member of our helpful sales team who will prepare an offer for you based on the latest spot prices and confirm the price via email. We offer very competitive rates for American Buffalo gold coins, so if you have any for sale contact us today.